Well, I've always thought of myself as a realistic painter with very little aptitude for painting abstracts. However, I realized today, as I was working on my band painting, that working on silver can make abstract artists out of the most die hard realistic painters. 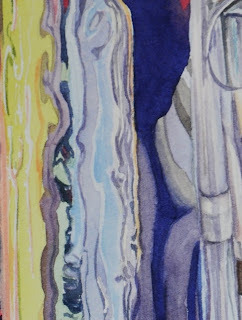 As you can see from the small section to the right, there are definitely abstractions happening in my silver painting. I am enjoying painting the random patterns and colors. 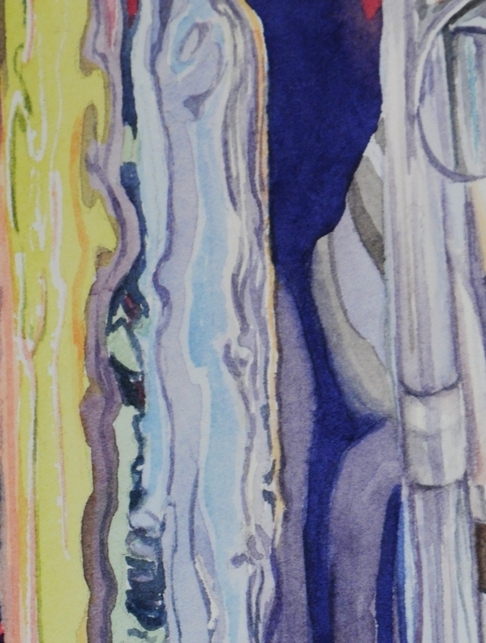 See if you can find this small section in the larger painting, seen here to the left. I am about 85% done with this painting. 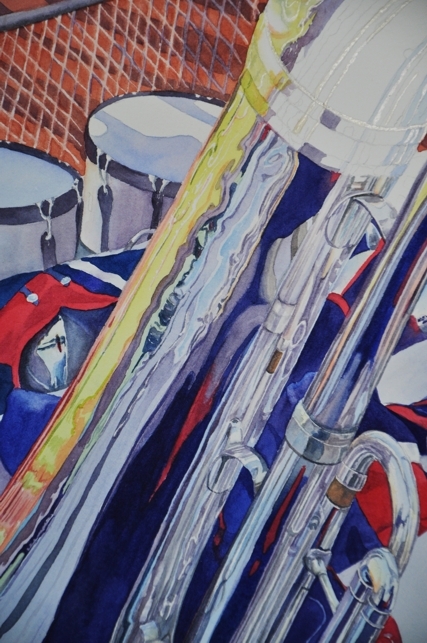 I still have the upper section of the marching tuba (or as my son says it is called - the contra) to finish up. I am continuously amazed at the things that are being reflected into the silver. Where I thought there were random reflections, I found reflections of the horn itself repeated. So, I continue to take my time to do the reflections justice. By the way two of my new favorite colors, Pyrrol orange by Daniel Smith and Green Gold by Daniel Smith are used in the reflections where the horn is greenish/yellow and peachy orange. These colors are bold and beautiful used full strength and also thin to wonderful light colors, as well. Thanks, I plan on painting more band paintings!